Female genital mutilation/cutting (FGM/C) is a harmful practice experienced by an estimated 200 million women and girls throughout the world today. The practice, which involves the cutting or removal of the external female genitalia or other injury to the female genital organs, has no known health benefits, but many known short- and long- term health consequences. While the age at which girls are cut can vary from infancy to adolescence, most girls are cut between the ages of 5-14. 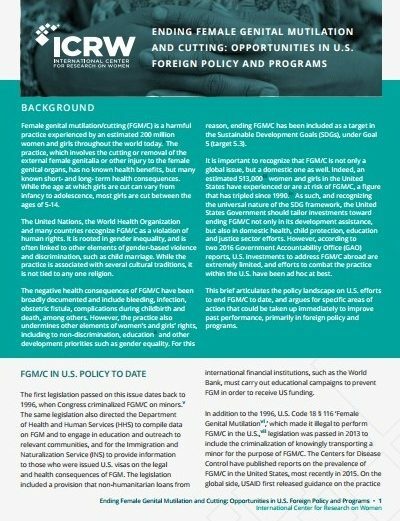 This policy brief lays out efforts taken by the U.S. government to reduce FGM/C worldwide and provides concrete recommendations for how the U.S. can leverage current and future investments to end the harmful practice. An accompanying white paper, which details the linkages between education and FGM/C can be found here.